Cool, damp and grey at Grosmont with thick fog on the Moor tops from either direction yesterday, although it cleared up in the afternoon and the sun briefly broke through. Steve Hyman, Bill Dobson, Chris Wakefield after his cleaning turn at the MPD, and myself were in time for the morning brew, and we were joined by a late running Ian Pearson who arrived just in time for lunch which was had in Deviation Shed. 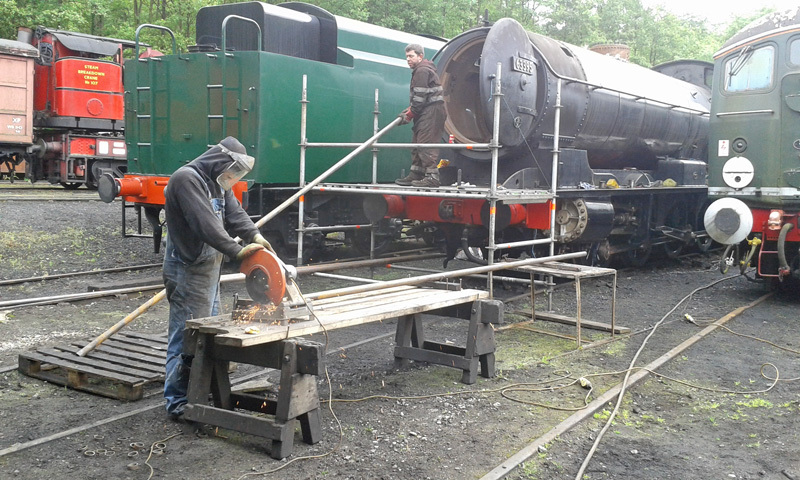 The Q6 had been pulled outside the shed so that Mark O'Brien and the boiler staff could make a start on retubing the boiler. The long running copper ferrule saga had finally concluded and it had already been fitted. By the end of the day, 55 small tubes had been cut to size and installed (see photo) - final fitting and beading over will come later. Now that Eric Treacy's boiler is back in the frames, the bulk of the boiler work is finished with it becoming a fitting job, and the boiler shop priority is now the Q6. The boier inspector is on holiday until 24 June and he has been booked in for the Q6 hydraulic on Tuesday 26 June. So Mark and his team have until then to get the boiler retubed before the official hydraulic is carried out. Expect to see some rapid progress! If that is successful, then the header and elements will be hydraulic'd, followed by a steam test and then hopefully back in service for the Gold timetable peak season which is the target. In the meantime, as we could not get anything done underneath the engine, Steve fitted the steam heat safety valve in the cab, with assistance from Chris Wakefield, after I had cleaned up the threads. I then fitted the new regulator stuffing box with assistance from Bill. Steve was in the process of fitting the vacuum gauge when it unfortunately fell accidentally onto the cab floor and broke the glass. It was returned to Andrew Jeffery for repair and will hopefully be back for next Wednesday. Ian got the job of removing the old paint from the regulator handle and giving it a coat of primer. With his permission, the padlocks on Maurice Johnston's lockers in the workshop have been removed to find lots of tools and various pieces of steel . We will need to speak to Maurice to sort out what he wants to do with all these items, as the lockers are full. Steve also took Martin Ashburner's dog for a walk around the site during the afternoon much to Martin's consternation - he thought one of the many visitors we had round yesterday had dognapped it! The J27 was running yesterday, but is being taken out of traffic today for a while for a boiler washout, water change and general health check after its nearly three weeks of regular running. The next working party will be on Saturday 9 June.